A man scratched a lottery ticket. Over the last six years, four members of the Jaafar family of Watertown have cashed in more than 7,000 winning lottery tickets and collected a cool $11 million. Statistics suggest it’s nearly impossible to win the lottery that frequently. But Massachusetts has more repeat lottery winners than any other state, people who redeem so many winning tickets that they raise questions about the integrity and oversight of the $5 billion state lottery, according to a first-of-its-kind analysis of nearly 11 million lottery records from 34 states. 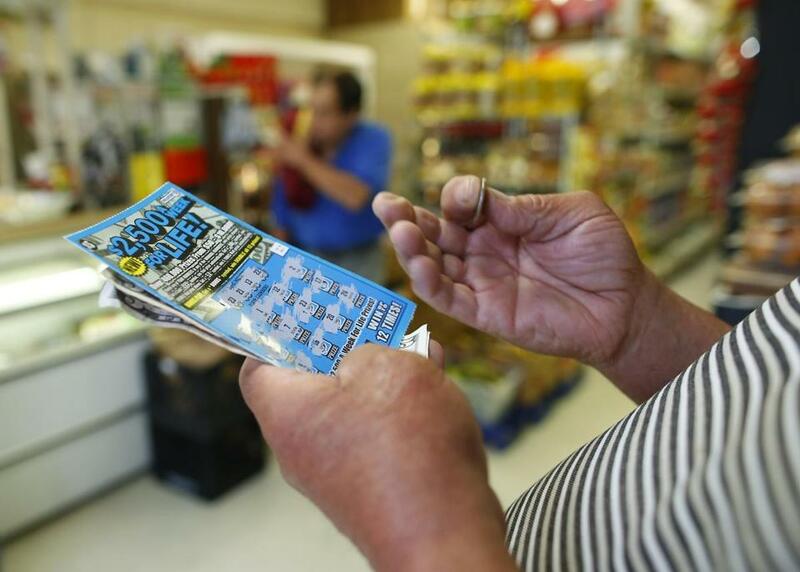 State officials have long suspected that some of the most frequent winners are cashing lottery tickets for customers who don’t want to claim the money themselves because they owe taxes, child support, or other debts, which would be garnished from their winnings. In exchange, the professional cashers, known as “10 percenters,” are believed to keep a cut of the prize money, likely 10 percent. Reports from the state auditor’s office dating back nearly two decades have warned that such practices are rampant and may be costing the state and federal governments millions in lost tax revenue. But such warnings have not stopped Massachusetts from turning into a haven for lottery players who win more than 1,000 times a year, easily outpacing the most frequent winners in Georgia, Ohio, and other large states who typically redeem fewer than 100 tickets per year. Beginning Oct. 1, the lottery plans to institute a new policy designed to crack down on professional ticket cashers. The policy will allow the state to freeze payouts to customers who redeem six or more prizes of $1,000 or more during a 12-month period. Players who are suspended will have an opportunity to appeal and show they are not violating the law. Sweeney said it is legal to cash other people’s tickets, but illegal to do so if the goal is to help them dodge taxes or debts. Despite that prohibition, Massachusetts has had more than 50 residents cash more than 200 lottery tickets worth at least $600 each over the last six years, giving the state more repeat winners than any other state for which data is available, according to the analysis by PennLive.com and students from Columbia University’s Graduate School of Journalism. The Fund for Investigative Journalism supported the project. Some of the winners assert they are professional gamblers who spend most of their time and money buying scratch tickets, and barely break even. But the tickets they cash come from so many far-flung stores, officials say, it is hard to believe they are buying them alone, and not collecting them from others. “In some instances, it almost makes you wonder if there would be enough hours in the day to even buy that number of tickets,” Sweeney said. Ali M. Jaafar of Watertown is a typically quizzical case. A 59-year-old who has run his own taxi and phone-card businesses, he won the lottery more than 1,400 times last year, the highest total in Massachusetts and nationwide. Over the last six years, he has won more than 5,800 times, collecting $8.9 million. But he wasn’t just buying from his local variety store. His tickets were purchased at 1,200 stores in 160 communities ranging from Springfield to Nantucket. “Do not want to talk about it,” Jaafar said, and rolled up the window of his Ford Explorer, when asked by two reporters how he manages to win the lottery so frequently. If Jaafar is buying thousands of tickets, he hasn’t made an impression at the four stores in Watertown, Somerville, and Allston where most of his winning tickets were purchased. Clerks at those stores said they had never heard of Jaafar. Three other members of the Jaafar family — Yousef, Munif, and Mohamed — are also frequent lottery winners. Over the last six years, they’ve cashed 1,200 tickets worth more than $2.1 million. And that’s not the only questionable activity they’ve been involved in. Last October, Yousef and Mohamed Jaafar were among 47 people indicted by a New Jersey grand jury for allegedly taking part in a massive fraud ring. Prosecutors say the scheme involved residents of Florida, New Jersey, and Massachusetts who set up bogus companies, which demanded payments from other companies and individuals. Prosecutors say the victims were duped into handing over $50,000 to $450,000. Yousef and Mohamed Jafaar each pleaded guilty to one count of second-degree conspiracy, and are due to be sentenced in November. Lynn is home to the player who has cashed the most tickets nationwide over the last six years: a 79-year-old named Clarance W. Jones. Jones, who calls himself a professional gambler, has cashed more than 7,300 tickets for more than $11 million over that time period. Perhaps improbably for a man of his age, his tickets were purchased at 1,400 stores in 150 cities and towns, including Nantucket. In 2011, he successfully defeated an effort by state officials to collect taxes on his prize money by claiming that he spends as much on the lottery as he wins. As proof, he produced boxes of losing lottery, Keno, and horse-racing tickets that his attorney said had been kept in a storage locker. Professional gamblers are entitled to deduct their losses under federal and state tax rules. Jones also submitted into evidence a manual he had written entitled “The Gambler,” which contained his “trade secrets” for beating the Massachusetts lottery, which he called “the easiest lottery system.” Those “secrets” included buying tickets in the middle of a pack, where he believed the winning tickets are grouped, and buying from stores that had recently sold prize winners, reasoning they had a greater chance of selling another jackpot. Contacted by phone, Jones told a Globe reporter to call his attorney, who did not return phone messages. Sweeney, of the state lottery, pointed out that Massachusetts may have more lottery winners because residents here spend $746 per person per year on the lottery, more than residents of any other state. Massachusetts also devotes the highest percentage of its lottery revenue to prizes, giving people more opportunities to win large sums.